I think this prompt is one of my favorites. Maybe it’s because it reminds me of the writers’ conference I just attended last weekend. To say the conference was motivating and inspiring would be an understatement. In the final address, keynote speaker Stephen James retold the parable of the talents. He encouraged us, as Christian writers, to use the talents, ideas, gifts, and words that God has given us — not to bury them. 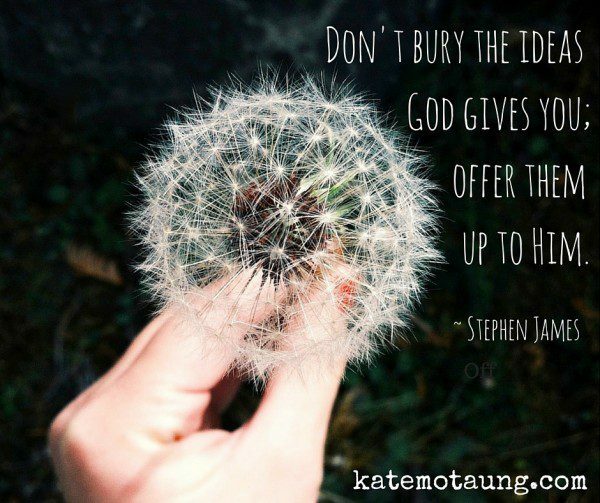 What ideas have you buried? What opportunities have you turned down because you thought someone else could do it better? What have you forfeited because you thought you didn’t have enough time? Take hold of those ideas — those God-given ideas — and put them to good use. Invest them and allow them to bring back a return. Don’t bury what you’ve been given. Offer them up as a living sacrifice to the One who has given every good thing. This is Day 17 of 31 Days of Five Minute Free Writes. For more posts from this series, click here.